Deamon was formed in the summer of 1997. It's first solid lineup featured Cory Malone on guitars and lead vocals, Matt Ralph on guitars, Jose Gogniat on bass and backing vocals and James Mace on drums. In 1999 the band recorded the 4-song MCD "End of Ages" which was very well received throughout the underground. In 2000 the band recorded the song Hells Bells for an AC/DC tribute album on Dwell records, which they followed with an appearance at the Milwaukee Metalfest in 2001. 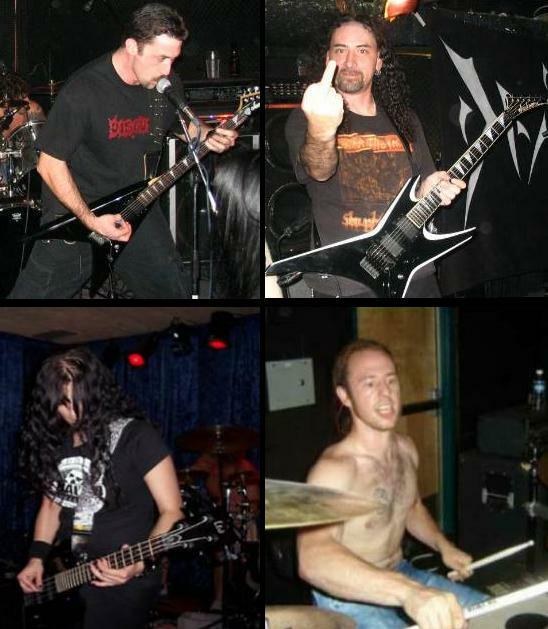 In early 2002, Shawn Carrier replaced James Mace on drums and guitarist Matt Ralph left the band due to family commitments.The first full length CD "Synopsis Of Sin" was recorded in the fall of 2002. Following the recording Jose Gogniat left the band due to musical differences and was soon replaced by Topon Das, at the same time Deamon had found a permanent guitarist in Ron McLean. "Synopsis Of Sin"was released in the spring of 2003. Now with the new line-up Nine new tracks were created with the whole band collaborating.Deamon began its live assault with the new lineup and new music.In 04-05 Deamon played many shows across Ontario and Quebec,including sharing the stage with the likes of Cryptopsy,Deeds of Flesh, Severed Savior,Immolation,Decapitated & Skinless. In the spring of 2005 Deamon recorded a new disc entitled "Descend Dethrone" showcasing the most brutal songwriting so far from the band.This disc will be released on March 8th 2006 on CDN Records.